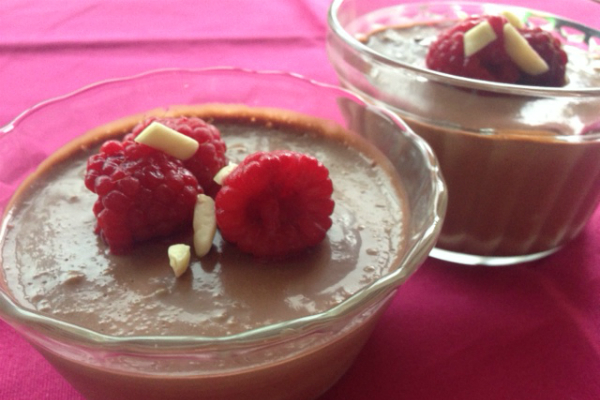 Don’t even bother with the words, “vegan” and “tofu.” Just let “silken chocolate mousse” roll off the tongue. It’s as creamy and delicious as it sounds. I haven’t been too successful cooking with tofu at home. It’s just not that appealing to me in texture even though I know its benefits as a protein in meatless dishes. In order to make the golden tofu that I enjoy so much in Thai restaurants it takes some skill with corn starch and patience to brown it just right in cooking oil. I haven’t mastered that well enough to do it for the low-level midweek cooking I prefer. 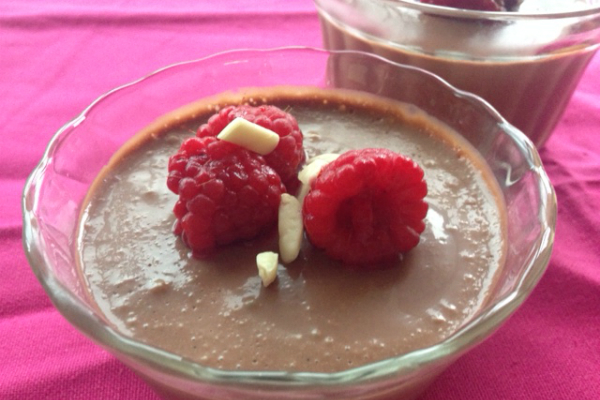 But use silken tofu to make chocolate mousse in a blender? That I can handle. I love this recipe. I’ve encountered it in different forms over the years, most recently in “Smoothies & Beyond” by Tori Ritchie. You have no idea you are eating tofu, it’s very smooth and creamy with loads of chocolate flavor. Simply: Yum. In the version of the recipe below, I used only a 3.5-ounce good-quality dark chocolate bar and skipped the almond extract, because I didn’t have any on hand. I’m sure more bittersweet chocolate and the almond extract would enhance the flavors, but I really didn’t miss it. 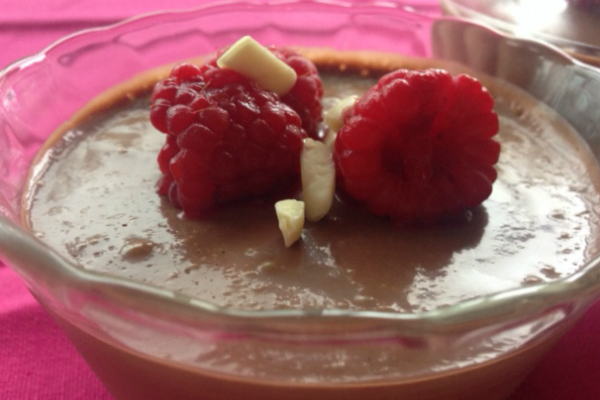 This dessert requires no eggs or dairy products, if this interests you from a vegan perspective. But I wouldn’t even focus on that when you serve silken chocolate mousse to your family or friends. Just smile and they will, too. 1. Set the can of coconut milk in the fridge for an hour or so to chill it. When you open the can, the fat will have separated from the liquid. You’ll need to either beat it together with a fork or dump it in small bowl and use a hand mixer to blend. Meanwhile, find four ramekins and set them in a baking tray. Drain the tofu and then place it on a paper-towel lined plate until you are ready to use it. 2. Chop the chocolate and set in a double boiler to melt. If you don’t have a double boiler, place the chocolate in a metal bowl and fit it into a sauce pan with about 1/2 cup of water and bring it to a boil (you only need a little bit of water, don’t let the bottom of the bowl touch the water). 3. Pour the chilled coconut milk into a blender, then add the melted chocolate. Add the drained tofu followed by the maple syrup, vanilla extract, almond extract, and pinch of sea salt. 4. Put the lid on securely and turn on the blender to low for a few seconds. Increase the speed to medium and blend another 15 seconds. 5. Remove the lid and scrape down the sides. Replace the lid securely and then blend on high for 30 second to aerate the mixture. 6. Divide the mousse by pouring it into the four ramekins, filling about 3/4 full. Cover with plastic wrap and refrigerate until the mousse is set, about 2 hours and up to 1 day. 7. When ready to serve, garnish with almonds, fresh berries, or chocolate if desired.